The first thing you need to do is install the L8 DFU Lite tool and the L8 Control Center Lite. The DFU tool is the more important of the two, as it is used to update the firmware on the SmartLight. You could probably skip the Control Center, as it doesn’t do much at this point, but it gives you a chance to play with the device a bit, so it’s worth installing. Download the latest versions of the DFU and Control Center tools from this page: http://www.l8smartlight.com/downloads/. You’ll need .NET Framework 4.0 and 4.5 to run the tools. Most Windows users will already have those installed, but just in case, here are links to the .NET Framework 4.0 and .NET Framework 4.5 installers. Install 4.0, then 4.5, and then run Windows Update to get up-to-date on patches. Extract the installers for the L8 tools from their .zip files, and install them. According to L8’s installation directions, you should already have the necessary SmartLight drivers installed, but I didn’t find that to be the case. So, let’s get those installed. We installed the software first because it also places the SmartLight drivers on your computer. The drivers still need to be installed, though. Turn on the SmartLight by holding the clear button/LED on the of the unit, then plug it into a free USB port on your computer. Open Device Manager in the Control Panel. If you see STM32 Virtual ComPort in FS Mode listed (see Figure 1), then you need to install the drivers. Figure 1: This is what you’ll see in Device Manager if you don’t have the correct drivers installed for the L8 SmartLight. Assuming you need to install the drivers, disconnect the SmartLight, then run the driver installer located here on a 64-bit system: C:\Program Files (x86)\SmartLight Inc\Drivers\VCOM__stsw-stm32102__v1.3.1\. If you’re running a 32-bit system, you’ll find the drivers in Program Files, instead of Program files (x86). 32- and 64-bit installers are available. Run the version appropriate to your system. See this website if you need help determining whether you’re running a 32- or 64-bit system. Once the drivers are installed, plug the SmartLight back in to your computer. You should then see STMicroelectronics Virtual COM Port in the Device Manager (Figure 2). You should also see the device in Devices and Printers (Figure 3). Figure 2: This is how the SmartLight will appear in Device Manager once the drivers are installed. Figure 3: How the SmartLight appears in Devices and Printers. Note the COM port shown next to the device. You need to enter that when using the Control Center software. Next, we’ll install the Recovery Mode drivers. These drivers are necessary to update the SmartLight’s firmware. With the SmartLight on and connected to a USB port, open the L8 DFU Lite software (found in the L8 SmartLight folder in the Start Menu). If the device isn’t found, then you can try clicking the Find L8 button. Click the Enter Recovery Mode button (as seen in Figure 4). This will reboot the device in recovery mode. Once the SmartLight has rebooted (you should see alternating white and blue LEDs on the top of the device), close the DFU tool. Figure 4: Clicking Enter Recovery Mode will reboot the SmartLight in recovery mode. Now, head back into the Device Manager and see how the SmartLight shows up. If you see DFU in FS Mode (Figure 5), then you need to install the recovery mode drivers. Figure 5: The SmartLight when in recovery mode, when the correct drivers aren’t installed. Click Browse my computer for driver software, then click the Browse… button. Browse to C:\Program Files (x86)\SmartLight Inc\Drivers\DFU Driver\. You’ll get a warning, as the driver isn’t signed. Choose Install this driver software anyway, then close the window. You should now see STM Device in DFU Mode listed in the Device Manager (Figure 6). Figure 6: The SmartLight device, in recovery mode, after the correct drivers are installed. Once the recovery mode drivers are installed, re-open the DFU tool. 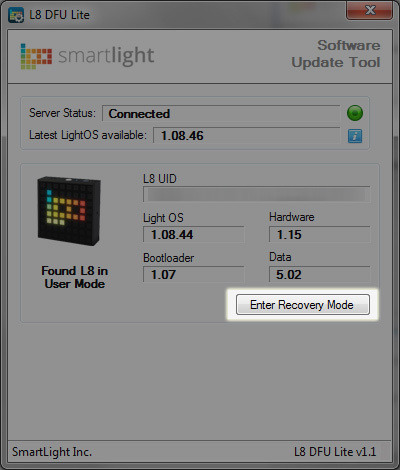 You will want to regularly check for and install updated firmware on your L8 SmartLight. Firmware is the software stored directly on the SmartLight device. It tells the device how to respond to the various commands it receives. First, open the L8 DFU Lite tool. 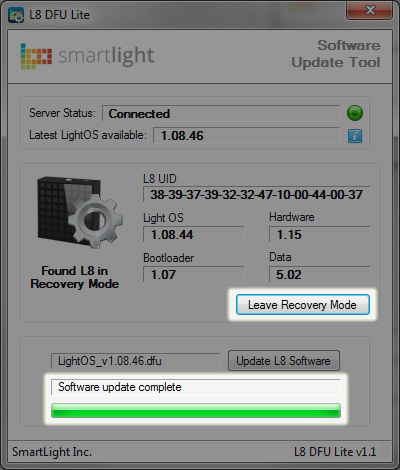 Click the Update L8 Software button (see Figure 7) to download and install the latest SmartLight firmware. 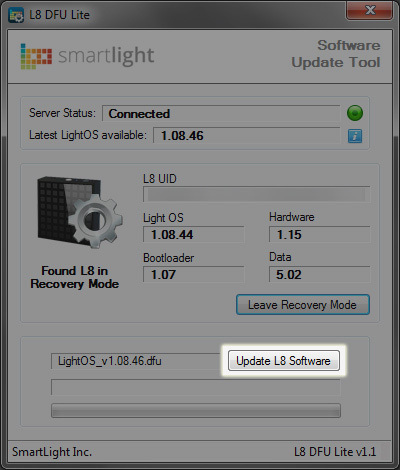 Figure 7: Clicking the “Update L8 Software” button will update the SmartLight’s firmware. When the firmware update has completed, click the Leave Recovery Mode button (Figure 8). This will turn off the SmartLight. You can then close the DFU tool and disconnect the SmartLight. Figure 8: When the SmartLight firmware update has completed, click “Leave Recovery Mode”, then close the DFU tool. You can now turn the SmartLight back on and use it as you normally would. Now that the various drivers are installed, and the SmartLight’s firmware has been updated, you can start trying it out. Software is pretty lacking right now, but it does exist. You can try out the Control Center that we installed earlier, or try pairing it with your iPhone or Android device. 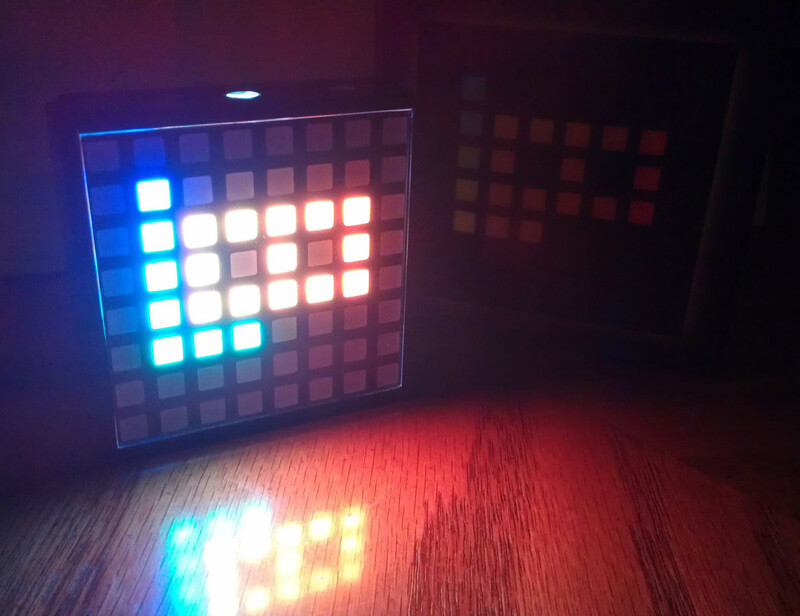 Software will make or break the future of the L8 SmartLight. Unfortunately, the long delays in the delivery of the device soured many developers on the platform. One can only hope that it will catch on and get a bit more attention in the future. This entry was posted in technology and tagged technology, drivers, L8 SmartLight by Dan Brust. Bookmark the permalink. Thanks for this. I struggled to get it to do anything until I found this article. I think they’re trying to cover up and ship it as though it’s a finished device, but it’s actually very alpha quality at the moment. They should include a set of instructions similar to the above with each shipped device until such time as they’ve got the drivers on Windows Update. The device seems to be of decent quality, so I’m happy about that, but they’ve really dropped the ball on the software and documentation side. It looks like their website is slowly improving, though. If they’d starting working on software and their website back during all of the hardware delays, maybe we’d have something solid by now. I’m actually quite disappointed. The device itself is very cheap and nasty feel to it. The top panel with the holes for sensors doesn’t even push flush with the body. The battery life is very poor (1 day!). There’s very little control over the device and even simple things like brightness seem to revert to “max” without me changing anything. It has a VERY bright white led on top which you can’t seem to turn off, and the other blue LED is also about 4 times brighter than a standard “power on” indicatior. I wouldn’t be suprirised if these LEDs aren’t the main reason the battery life is so poor. Some of the sample apps don’t even work; eg party mode only works if you have the music insanely (ie damage your hearing) loud as the microphone is so insensitive. Think I’ll try and return mine or sell it. In fact I’d love to know how this got through focus group testing. The developer either only asked their mates (who always just say it’s brilliant) or more likely, he didn’t actually do any focus group testing which is a basic schoolboy error. I can’t blame you for wanting to be rid of it; you have some pretty fair criticisms. I suspect all of the brightness and always-on issues can be fixed via firmware updates, but at this point, I’m not sure if we’ll ever see those updates. This seems to be a side project for the developers, at best, and I’m sure they skipped any sort of real-world testing.